and you forgot step 3 - CANCER!!! Mattia Binotto's promotion to Ferrari team principal as replacement for Maurizio Arrivabene could be interpreted as a kneejerk reaction to yet another failure by the Maranello team to win the Formula 1 world championship. In an era where stability has paid such dividends for Mercedes, some may question why Ferrari has once again appeared to fiddle rather than focus on the small improvements it needs to turn its promise into championship trophies. But to understand why the move has been taken, it is important to realise that away from the race victories and championship challenges Ferrari has mounted in recent years, it has found itself severely lacking in several areas - specifically in the way the racing team was being run. In the end, those factors highlighted that change and a new culture was not only desirable but needed. Sure, the timing of the move isn't ideal, but what's clear is that Ferrari's top chiefs have quickly come to realise that behind the Harry Potter-style glasses of the quiet and unassuming Binotto is someone who not only understands how a racing team works but can also help inspire staff and lift them - rather than act as a crushing force like his predecessor so often did. If you dig a little deeper into the reasons for Ferrari's turnaround since its disastrous first year with the turbo hybrid engines that prompted the split with Fernando Alonso at the end of 2014, it's Binotto rather than Arrivabene who has been most influential in lifting its form. He first of all helped turn around its engine situation after taking control of that department in the wake of Luca Marmorini's departure in 2014. His efforts swiftly pulled the red cars towards the front of the grid, and set Ferrari on a path to rival Mercedes for the accolade of having the best power unit on the grid. That work made it obvious to then-Ferrari president Sergio Marchionne that Binotto was the right man to take over the car side of things too in the wake of James Allison's departure in the summer of 2016 - even if outsiders were sceptical at the time. After all, despite a lengthy career at Ferrari, Binotto's CV had never included the design of any racing car. And here was the man that the team was hoping would be able to take on the might of Adrian Newey at Red Bull. But Binotto's move was not about having the technical department led by the best design genius the team could get its hands on. It was about having things run by the man who could get the most out of the brilliant brains Ferrari already had. Some of the world's best film directors can't act; championship-winning football managers may be unable to score goals, and renowned orchestra conductors may not be experts in playing all instruments. But what they all have in common is the ability to know which people they need around them, how to get them to work together and how to extract the best from them. This is where Binotto fitted in. The same qualities that had helped Binotto guide Ferrari's engine department back from its terrible 2014 effort were exactly what were needed to improve its chassis too. A modern F1 team is no longer a case of a car being designed as a one-man show: it's about pooling together hundreds of personnel to simulate, create and test new ideas to make the progress. Decisions are based on hard data and feedback, not the whim of an individual. Binotto very much wanted a new approach to how Ferrari's technical department was run. Rather than opting for a power grab and direct control over everything that went on, he set about getting support for a new structure. Gone was the old vertical organisation of the technical boss sitting on top of each department head. In came a more horizontal system - where all staff had a better say in how things were done, and were more able to get involved in the decision-making process. The outcome of this approach was a team better at thinking outside the box, rather than having a mindset of just trying to keep the tech chief and team principal happy. Ideas were allowed to flourish. This way of working opened the door for a number of Ferrari innovations in recent years - including its unique sidepods, mirror solutions, a double battery arrangement and even auxiliary oil tank use. The horizontal structure also meant the different departments worked better as a cohesive unit to help produce the best overall cars. It wasn't the case of one group vying to become 'teacher's pet' to get free reign for their part of the car to take priority: an overall chassis performance target was laid out and everyone had to contribute the best way they could to that goal. The aero department, gearbox department and chassis department were no longer working in isolation and then having everything merged together at the end. From the start of the process, everyone worked together for the global good. Of course, there were some hiccups along the way. The reliability dramas of late 2017 proved costly for Ferrari's championship ambitions, but Binotto had been mindful of quality control being a weak area and had already started working on a solution before the failures hit. The end of last year was also blighted by problems with extracting the best from a series of car upgrades as the team failed to capitalise on the overall strong base of the SF71H. While that stall in technical progress in late 2018 contributed to Ferrari's championship situation, the driver, management and team strategy errors were ultimately much more costly. And those latter aspects were all firmly at the door of Arrivabene. Plus, the ebb and flow of car development, with teams sometimes getting it wrong as they strive to improve, is part and parcel of life at the front of the grid. Mercedes hasn't been perfect in this regard and has found itself dealing with a 'diva' of a chassis in recent years. Binotto's organisational talents will be a bonus when it comes to pooling the best from Maranello. He has an intense understanding of the car operations - both inside the factory and at the racetrack. His umbrella approach, of being able to cover all areas while trusting those underneath him, should allow the team's quality to rise up rather than be fearful. His calm stance can also help ease the siege mentality the team has been under with Arrivabene, whose media lockdown added unnecessary pressures. By pushing the press away, Ferrari was unable to control the message. It lost the PR war from the off, so when things turned bad, the criticisms piled up - making the team think the world was out to get it. This served to only increase the pressure to succeed far beyond what it needed to be, and left the team trapped in a negative spiral. As Ferrari has shown in recent years, having a very quick car is no guarantee of winning the world championship: but it's an essential element if you want to have any chance of success. Binotto played a key role in giving Ferrari that important first part. Now, the same philosophies and qualities are what he now needs to bring to the table to produce a team that operates better. If he does that, Ferrari's rivals had better watch out. Where did Maurizio Arrivabene go wrong as Ferrari Formula 1 team boss, and what legacy does he leave? Results will show whether it is an improvement. In order to know what to look for in the results, you need to know what targets have been set by management. For instance , do we (fans) know what the upper management target for ? Do they target for next year? Do they target for the next .. 3? years? So, when you say , "results will show", what do you target as results? Do you target for next year? And what if, part of this change is changing team leadership in order to restructure key parts, which could only mean that visible changes in results would start showing in say, at least two years from now? Fans need and want winning results immediately if not sooner ! The first 2019 practice, quali. race, Ferrari in the #1 spot!! What Ferrari fan doesn't wish it was Ferrari that won WCC, WDC 2018 and could have spent the winter happy and bragging? Ferrari drivers should not have the slightest though that the team is using 2019 in prep mostly for 2020 . If waiting around for a year or two was the way to go, Ferrari should have let Stroll buy in as their new driver for two seasons. Take in a few Billion $$$$ and then let him go. Of course it's possible, even if he was on gardening leave he could share data. How can they control if Arrivabene's wife send an email to Wolff's wife with tons of Ferrari data?. Gardening leave has always been a joke. I don't think he will do something like that anyway, what is the point when he is out of F1 and nobody is going to hire him?. After Marchionne's death, Camilleri was going to keep things stable.....Vettel-Kimi for 2019 and Leclerc still with Sauber plus Arrivabene still at Ferrari. After all, Camilleri is taking direction from Arrivabene. "Interestingly, it was Ferrari chairman, Sergio Marchionne, who appointed Arrivabene, and in the wake of end-of-season reports that his position was under threat, the Italian snapped "My position? Ask, Camilleri", referring to the new Ferrari chairman following Marchionne's passing in the summer." "The man driving the claims of the team going the wrong way in its development was Arrivabene, which ultimately led to claims that Binotto was to leave Ferrari in a move that which would trigger an off-season game of musical chairs which could include James Allison heading to Renault. However, Arrivabene dismissed the talk as a deliberate attempt to destabilise the team." It's not just [Autobild] reporting this but this article as well. Maybe both articles got their info from the same Italian source???..maybe. Elkann stepped in with Leclerc (that was a hard pill to swallow but I get it "out with the old(Kimi) in the with the new sorta thing") and Elkann stepped in with Arrivabene's firing and hiring Binotto due to what happened in the 2nd half of the season. Arrivabene is marketing, Binotto is technical...IN F1!!!! This is a good move for the Scuderia. Talk is that all this change will de-stabilize the team and I'm telling you this will re-energize the team IMO....if it has'nt already. My only concern is the 2nd half of the season but I'm more than sure Binotto will not let that happen....again!! Maybe, just maybe, Vettel is talking to Elkann of what changes need to be made....not with Leclerc....but with Binotto. This is hypothectical of course. I don't think he was smart enough in the technical part of the car because he definitely had no idea about tires and strategy. He seemed like a nice guy and didn't really talk much. Good luck in what ever he does. Does anyone know if he is still working at ferrari in some way cause if he left on bad terms Merc and red bull will sniff around forsure. Arrivabene was a real nice guy. He lived and breathed Ferrari why would he give away our data to competitors? He deserves a much better legacy than Domenicali who was full of excuses. I hope he stays within the Fiat group or maybe he will go over to Sauber and help Kimi. Arrivabene was offered a directors role for the soccer team Juventus some months ago......might be appealing to him given the circumstances. I did see a source that he MIGHT be offered a support role for Alfa-Sauber or FIAT....forgot which.....who knows. Well said... But with team like Ferrari and all the money they have and have been investing, nothing less than WCC and WDC in 2019 cannot be target?! As for the bolded part. As you are american, let's use a football analogy. Let's say both sides of the ball (offense and defense) is everything that goes on at the F1 department in Maranello and the on-track activities are special teams. I mean if the offense and defense don't play well (produce a great package) then it doesn't matter how good or bad the special teams play. Do you agree so far? So my question is this. Who in their right mind would put the star running back on special teams? Sure, he might be a good blocker and a great athlete and will shine anyway but that will limit his playing time on offense as he's human as well. Back to Ferrari. Binotto is that star running back. He's the one at Maranello (offense) who has overseen things and produced the goods. Binotto can't have two functions. He can't play both on offense and special teams. His time on special teams will limit his time on offense. That will most likely hurt the team's performance is the long run. Besides, the kicker on special teams often saves a stalling offense by at least scoring 3 points. Arrivabene was that kicker. He took away pressure from everyone when things were not going great. Can you now see why I'm worried and why I question the idea of moving Binotto from Maranello to the track? This move reeks of desperation. Ferrari now say there will be no exact function like the one Binotto had at Maranello. Mekies maybe will have it officially but Binotto will still be the one having the last word. This reshuffle, in my opinion, is dangerous. Last edited by 512 TR; 9th January 2019 at 12:39. Can you now see why I'm worried and why I question the idea of moving Binotto from Maranello to the track? This move reeks of desperation. Ferrari now say there will be no exact function like the one Binotto had at Maranello. Mekes will have it officially but Binotto will still be the one having the last word. This reshuffle, in my opinion, is dangerous. FYI, Vettel backs Binotto's move as well....100%. I'm more than sure they talked to him prior to all this movement between Arrivabene-Binotto. You are entitled to your opinion. He already sits in board of directors of Juventus FC. According to media he is now/again linked to CEO role of the same club. Can he really say anything else without falling out of favor? Wouldn't it have been better to keep Binotto where he's done a great job and get a new team principal from somewhere else instead? I mean if the powers that are still wanted to get Arrivabene out anyway. Do Ferrari really have so few competent people in their ranks that they had to make this move? One more thing. 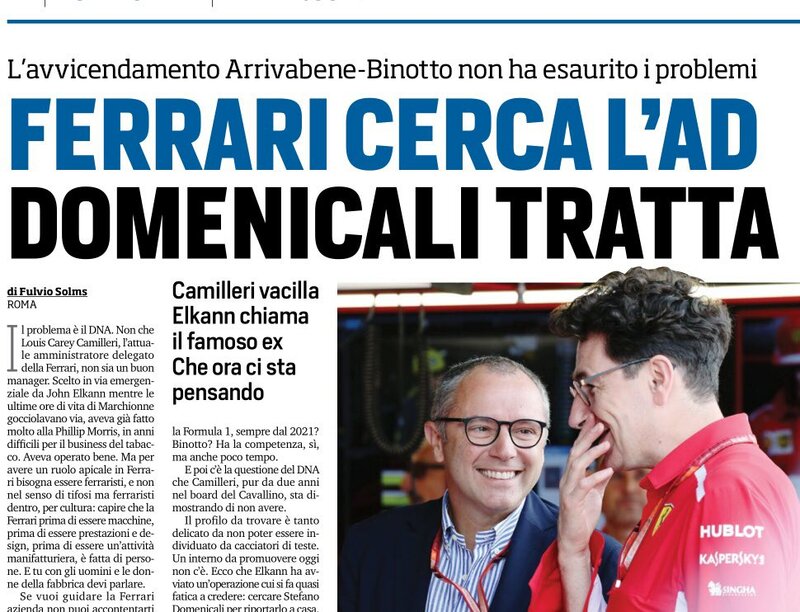 I really hope I'll never have to hear and read things in the future like Binotto told Elkann "It's me or Arrivabene. I'll walk if you keep Arrivabene". Last edited by Rishu; 10th January 2019 at 01:26. The season last says it all , "I can't work with this guy!" Those 2018 results speak louder than words. What have we got to lose that we haven't already? Framing things as catastrophic at this point does not make sense. Binotto's been with Ferrari F1 since '95. Arrivabene, an outsider, came into Ferrari F1 in 2014 into 2015. I would rather fire Arrivabene and keep Binotto from going to Mercedes if the ""It's me or Arrivabene. I'll walk if you keep Arrivabene" phrase was presented to me. Vettel's been with Ferrari F1 since 2015 and he stays late and comes in early to know the workings of the car and mechanics; he's technical....alot more than Lewis. Vettels been in F1 alot longer than Arrivabene and knows how F1 works within the paddock. I'm sure he had a say, when asked, on who should go and who should stay. Last edited by jgonzalesm6; 10th January 2019 at 11:12. Like I've been saying....technical; word of the year for 2019. Binotto and Vettel have it. I've been saying there's a feud going on within the ranks of Ferrari. I like the way Piero "graciously" admits Camilleri "needs work." Piero Ferrari explains the revolution: "We gave technical continuity to the Scuderia"
The vice-president of the Cavallino has motivated with Gazzetta dello Sport the change at the top of the Sports Management with Binotto instead of Arrivabene. And Piero also blinds the role of CEO of Louis Camilleri: "He has just arrived, let him work". The appointment of Mattia Binotto to Ferrari team principal gave a boost to the stock market on the Cavallino titles which, after a series of rebates, began to grow again, a sign that the uncertainty that prevailed in the Scuderia was also influencing the titles. Piero Ferrari, in his role as vice-president and shareholder, had an active role in the revolution at the top of the Racing Department that led to the release of Maurizio Arrivabene, to give full powers to Mattia Binotto. "Everything happened before Christmas - said the son of the founder to the Gazzetta dello Sport - then for various reasons we had decided not to divulge the decision. I do not want to go into details, also because I can only speak as a shareholder, but I only say that there was a confrontation between us members, with John Elkann and in the end we acted in the exclusive interest of Ferrari ". "You wrote a little 'all, but we wanted to preserve the technical continuity, without creating any disturbance in the structure of the Scuderia." "I say that we must allow enough time to work on Louis Camilleri who has just arrived in Ferrari and undoubtedly has his own style, different from that of Marchionne, which is in turn unique and inimitable". This statement extinguishes the rumors of those who spoke of resounding returns to Maranello: Stefano Domenicali, current president and CEO of Lamborghini, was among the names sifted in Turin to succeed Marchionne after the premature death of the president. The former team principal is very close to Binotto: he was part of managerial poker, together with Luca Colajanni and Mario Almondo who grew up together in the Cavallino's ranks, climbing the various stages of the Racing Department. [Autobild] Under Arrivabene‘s leadership, even the die-hard Ferrari enthusiast Vettel doubted whether Ferrari would return him the same love he had for the team. Therefore after the summer, Vettel had some private dinners with Mattia Binotto. Regarding the whole thing with Binotto saying "it‘s either me or Arrivabene." Autobild reported that Binotto did not only speak for himself, but a works council, that means he spoke for the vast majority of the team. They were all behind him in this. He is supported. Domenicali to make a comeback??? Sauber perhaps could use his marketing/branding expertise. But if Juventus position is available I don't see him choosing Hinwil over Turin. Based on location.......I can see your logic. I was thinking mostly of their vast market value difference.